Our extensive range of the gamut includes orthopedic implants, instruments boxes casting tape and many more. 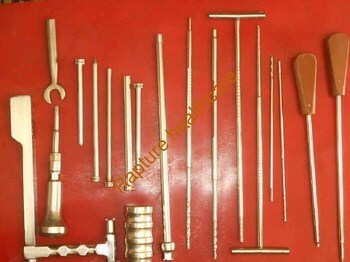 All these implants are manufactured using internationally graded Material & in customized sizes as per the requirements. WE also Design boxes and instruments as per the customer requirements For any requirement for orthopedic implants, orthopedic instruments and casting tape please fell free to contact us at 9818263008 or mail usFor bulk quantity get the best quote . Given an opportunity we would be highly grateful to provide our product & services at your disposal. Please feel free to get in touch at the below contact details to get the best pricing & complete list of product available with us.